Whale Watching in Iceland is the most popular visitors’ activity, attracting tens of thousands of people from across the world each year. Enjoying these gentle giants in their natural habitat is one of the greatest natural privileges available to you during your trip to the land of ice and fire, but just where exactly are the prime whale watching locations, and is it possible to find holiday rental cottages nearby? With over twenty different species of cetacean (ie. whales, dolphins and porpoises) calling Iceland’s coastal waters their home, guests on these tours have the opportunity to spot such animals as Killer Whales, Humpbacks, Harbour Porpoise and Minke Whales, to name but a spattering, over three to fours hours of high seas adventure. 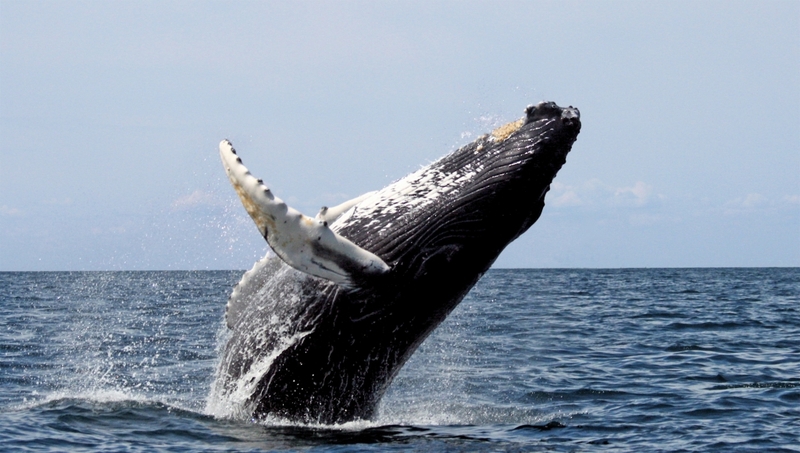 Whale watching adventures often go hand in hand with bird-watching, and even sea-angling tours. 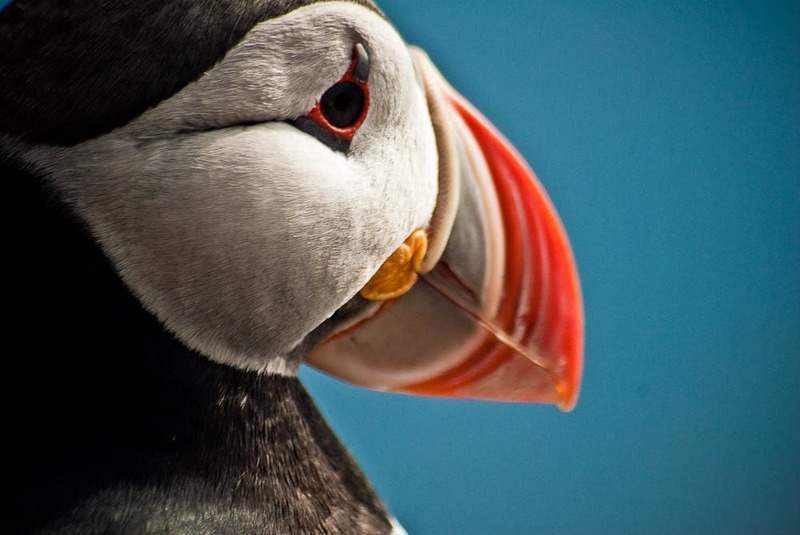 Whilst out scoping the open ocean for cetacean life, it’s more than likely that you’ll scout such birds as Guillemots, Arctic Tern and the iconic Atlantic Puffin, among others. With this in mind, be aware that whale watching tours are, in many ways, full wildlife tours, allowing you the chance to see all types of Icelandic creatures in their own environment. Be aware that whilst it’s highly recommended to bring gloves, a hat and scarf, operators do provide guests with warm thermal overalls. Given Iceland’s notorious and unpredictable weather, however, it is always best to be prepared for all scenarios; there’s nothing more uncomfortable than being wet and cold on the high seas. If you find on the day of your tour that it’s raining, fear not! Whales tend to breach more during poor weather, with many biologists claiming the vibration of the water makes the animals more playful. Let’s face it, whales are marine creatures, and therefore don’t give two tail slaps whether it’s raining or not—neither should you! Your professional whale watching guide will do their best to persuade those onboard to call out should they sight a whale or dolphin, asking them to call out ‘hands of the clock’ as a way of direction. They will also direct you as to what to look out for, be it the slight black hump of a whale’s back, or a flock of seabirds feeding in the waters below. Some people are prone to seasickness, a fact the majority of whale watching operators are rightfully aware of, meaning they’ll likely have medication on board (make sure to check with your specific tour company prior to arrival). Anti-seasickness medication can also be purchased at local pharmacies under the name Postafen or Dramamine. 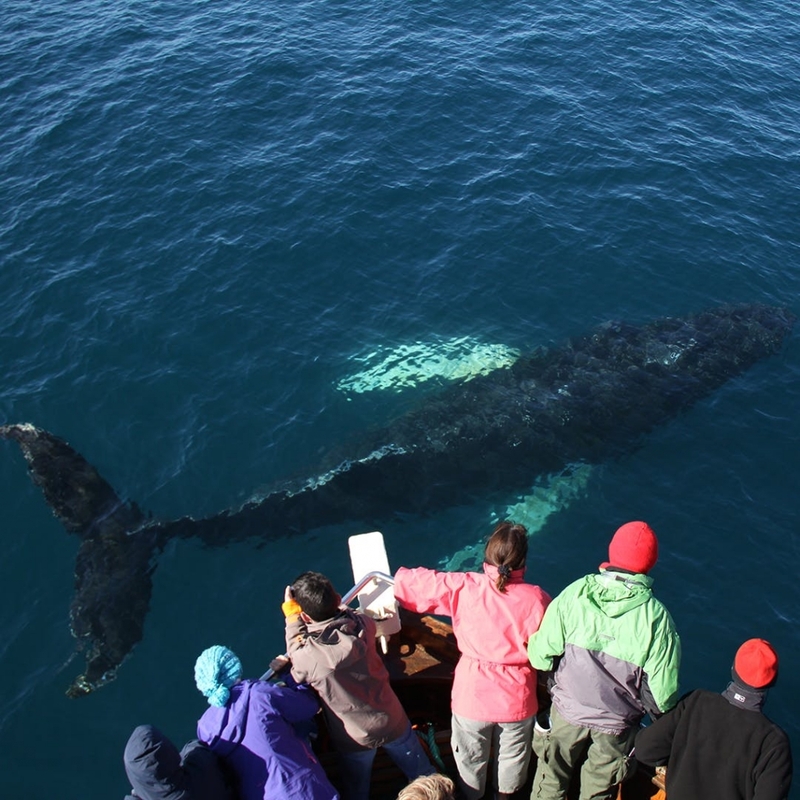 There are a number of different locations in Iceland where is it possible to partake in a whale watching tour, with some sites being more acknowledged for the quality of their experiences than others. Naturally, we start here at home, in Reykjavík. 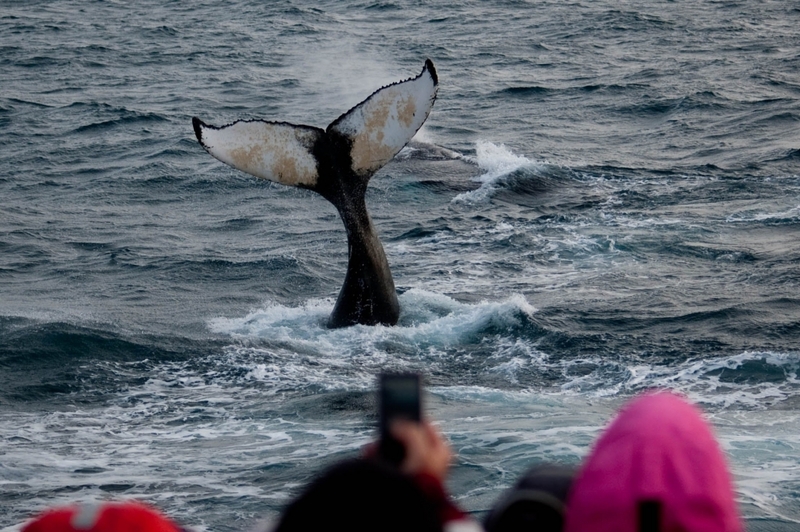 Reykjavík, Iceland’s picturesque capital city, is the country’s most popular location for whale watching, due in large part to the sheer human traffic. Grandi, where Old Harbour is located, is Reykjavík’s most popular destination and, on any given day, will be buzzing with vibrancy and life. This area boasts some of the city’s most appreciated and critically-acclaimed bars and restaurants, the perfect ending to an afternoon on the ocean. Whilst the waters of Faxaflói Bay are known to be less active than the seas up north, the industry is still alive and well at Old Harbour, with multiple companies heading out each day in search of mammalian life. 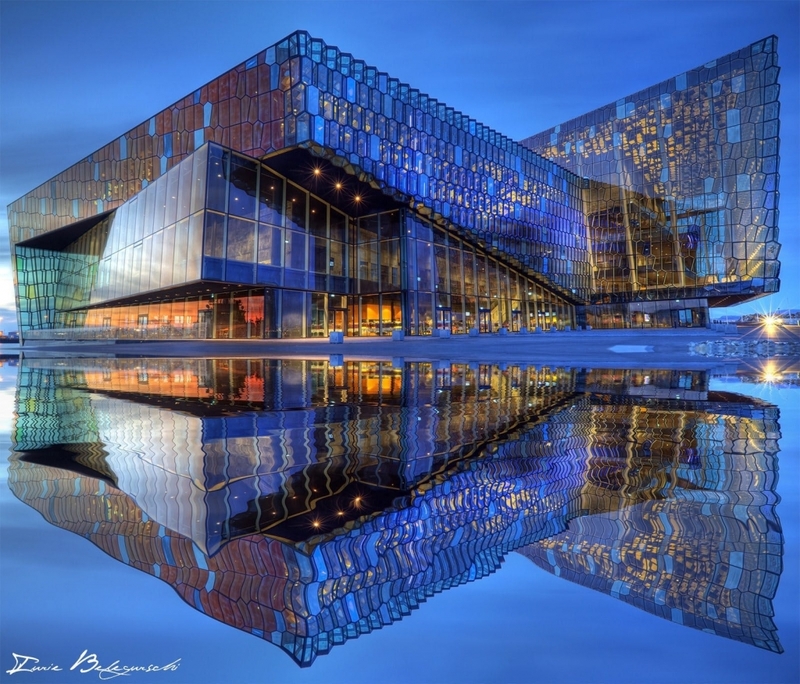 On the outset of your journey, you will enjoy the sight of Reykjavík from the ocean, passing by such landmarks as Harpa Concert Hall and Conference Centre on your way onto the Big Blue. The most common sighting on whale watching tours from Reykjavík is the Minke Whale. These inquisitive creatures will often swim up, under and alongside the whale watching vessel itself, equalling the enthusiastic curiosity of those on board. When this happens, guests on the boat are able to subtly predict which side of the boat the whale will surface, allowing for more detailed photographs and a more striking experience. 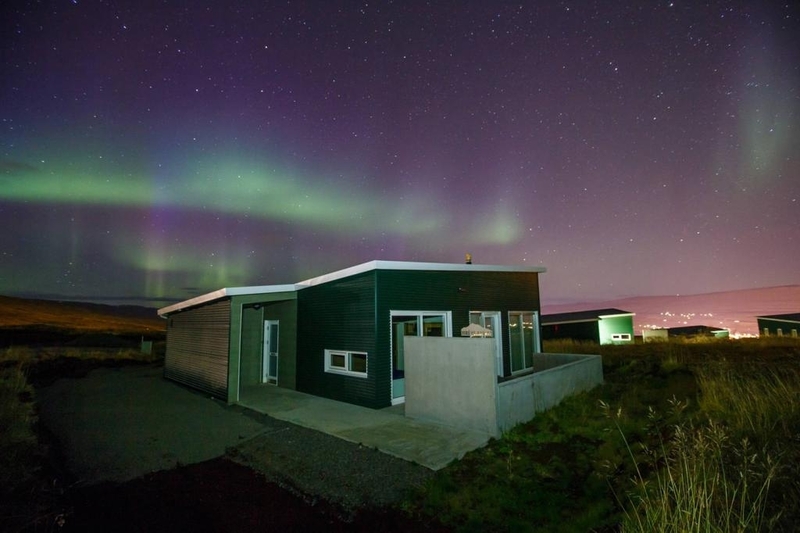 Those looking to both engage in whale watching tours from Reykjavík and rent out their own holiday cottage, need look no further than examples such as the three bed-roomed Centrespot Holiday Home, perfect for travelling families, or for the couple, this renovated studio apartment will more than fit your needs during your time in Iceland. Other holiday cottages that may be of interest in the Capital Region can be found here. “The capital of the north”, Akureyri, is looked upon favourably as a whale watching destination thanks to its abundance of visible animals, picturesque surroundings and easily accessible harbour. Besides being one of the most beloved towns in Iceland, Akureyri’s whale watching is but the cherry on the cake of a location that draws so much from culture, the arts and its local history. The Botanical Gardens, for instance, is just one example of Akureyri’s many attractions. Visitors can also see the iconic town church, Akureyrarkirkja, as well as admire the phenomenal architecture of Hof Cultural and Conference Center, found just on the town’s shoreline. The town also boasts a number of fascinating educational institutes, including the Akureyri Museum, the Motorcycle Museum of Iceland and the Aviation Museum. All of these reasons and more are enough to visit the northern capital during your stay in Iceland. In the summers of 2016, 2017 and 2018, the vast majority of Akureyri’s whale watching operators reported a 100% success in sightings, proving this area’s quantifiable superiority over other locations. Many claim that the excellent sightings come down to the fact that North Iceland sees considerably less rainfall than the south and west, which in turn, means more sun. This sun enlivens the underwater environment, making for more beneficial feeding grounds. Examples of cottages that can be found around Akureyri include Bakkakot, a one-bedroom cosy cabin in Akureyri’s adjacent woods, as well as The Old Shop, a romantic apartment in the heart of downtown. Another option could be the Luxury cottage in Akureyri, only 4 km from the city center, and sporting such amenities as a hot tub, gas BBQ, Wifi and a washing machine, to name only a handful. If you’re imagining a different type of accommodation, one can locate other properties to rent here. Húsavík is widely regarded to be Europe’s whale watching capital, making it, by default, the best place for spotting cetaceans in Iceland. Iceland’s first ever whale watching ships left this port in the mid-90s after passing visitors made requests of the locals. Since that day, whale watching has gone from strength to strength, making Húsavík a town spoken of around the world. The Húsavík Whale Museum is also located in the village, providing more reasons for avid wildlife lovers to visit. Here, one can learn about Iceland’s contentious history of whaling, as well as study the habitat, biology and behavior of Iceland’s largest animals. There are a handful of rental cottages that can be found around Húsavík. These include Ásbyrgi apartment, the small but charming cottage of Vetur Setur, or the home known as Hagi, which comes with three separate sleeping areas, close proximity to both Húsavík and Lake Mývatn and incredible surrounding views. Other properties around Húsavík can be located here. Dalvík is mainly known for three things; it’s iconic white church, as the departure point for the Grimsey ferry, and alpine skiing. Added to that list, however, should be whale watching, given the town’s close proximity to both Akureyri and Hauganes. Because of this proximity, the whales obviously travel the full length of the coast and beyond, making Dalvik just as likely to provide quality tours. The area is particularly renown for spotting Humpback Whales, rather than the Minke Whale, which are a more common sighting down along the South Coast. Adult Humpback Whales can range from 13-17 metres in length, and boast a lifespan of approximately 95 years. They are also known to attract their mates by singing, and undergo the longest migration of any mammalian species, often exceeding 10,000 miles on a round trip. All of these reasons and more justify renting out a holiday cottage in the Dalvík area, especially those looking to focus on Iceland’s north rather than the more popular south. One such property is this Old Farmhouse of Vegamót, Other choices for accommodation near Dalvík can be found here. Approximately 14 kilometres east of Dalvík, one can find the small fishing village of Hauganes, a settlement most famous for an ancient battle that took place in 1246 as part of the Age of Sturlungs. Today, it is a popular stop for tourists looking not just to watch whales, but to experience daily life within some of the country’s smaller settlements. Only a twenty minutes drive from Akureyri, Hauganes is conveniently placed to the region’s largest towns, despite only sporting 140 permanent inhabitants (…whales excluded)! 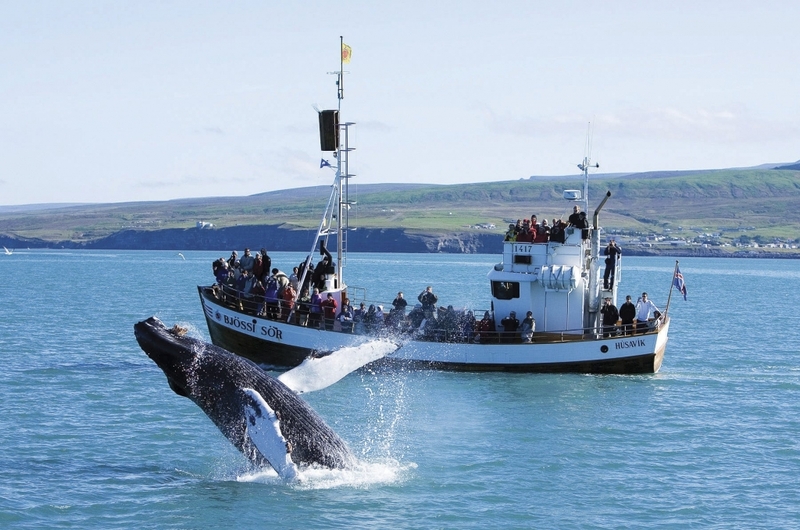 The tour operator, Whale Watching Hauganes, is the oldest of its kind from Iceland and departs from the village. Aside from that, the nearby fjord of Öxarfjörður is famed for its whale and seal sightings. Properties in the region of Eyjafjörður include the likes of Götusel. Another option is Sólsetur. 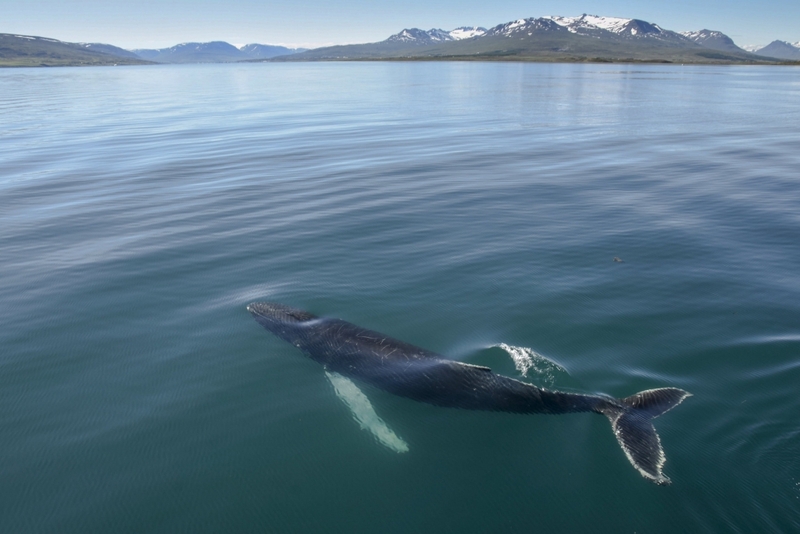 These two options would also work for those looking to stay local to Akureyri and Dalvik, making it one of the most accessible areas for watching whales in the north.